Features List Secures your online banking activities, ensures that your children stay safe on the Internet, and guarantees your PC’s safety against known and unknown malware. Advanced DNAScan The ingenious Quick Heal DNAScan technology is now enhanced to combine behavioral and characteristic inspection and monitoring of malicious programs. This results in a clean, more up-to-date, and accurate threat detection. User can select from three levels of detection. After detecting any suspicious behavior, the Behavior Detection System suspends further activities of the application and prompts user with Allow and Block options If the application is blocked, the application is terminated and its executable is quarantined. Behavior Detection System’s options can be configured from Files & Folders – Advance DNAScan. There are three defined levels of detection that the user can select from, namely: High: Behavior Detection System will closely monitor the behavior of a running application and will alert if any unusual application behavior is noticed. Moderate: Behavior Detection System will alert if any suspicious activity of a running application is noticed. Low: Behavior Detection System will alert only if any malicious activity of a running application is noticed. Safe Banking This feature is designed to protect your online banking activities from fraudulent websites and malicious programs that steal financial information. 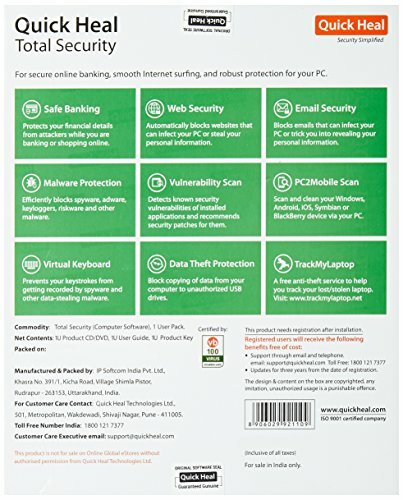 This antivirus feature provides you with a safe desktop session where your financial transactions on banking portals, shopping and other e-commerce websites stay private and hidden from hackers. You can launch Safe Banking by clicking its shortcut on your desktop. You will be taken to a private session where you can shop and bank online securely. 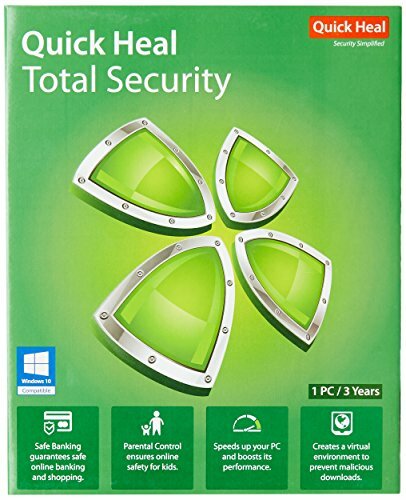 Vulnerability Scanner This is a proactive antivirus feature that notifies you of critical security vulnerabilities that can be used by hackers to compromise your PC and data stored in it. The feature also helps you fix these vulnerabilities. The feature runs in the background as soon as you initiate a Full System Scan on your PC. PC2Mobile Scan Earlier, users had to go through an exhaustive list of mobile devices to select their device type and scan it for viruses and malware. The improved PC2Mobile Scan feature has simplified this process. Users can now simply connect their mobile device, search for it and scan it in seconds. This feature supports Windows, Android, iOS, BlackBerry, and Symbian devices. 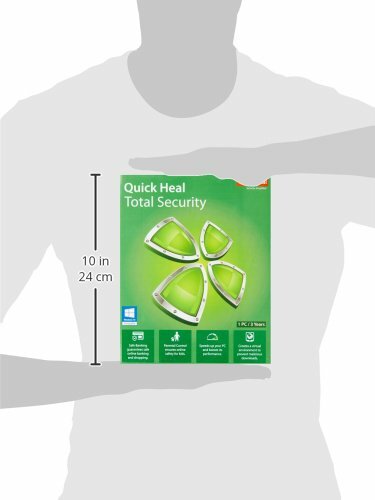 Quick Heal Remote Device Management (RDM) This is a free portal where you can add your Quick Heal enabled device, view its current status, and get notified of any critical situation such as malware infections. Via the portal, you can also renew your product license. Firewall An essential antivirus feature, the Firewall comprises the Stealth Mode. When this mode is ON, your PC becomes invisible in a network. This prevents hackers from tracing your system and attacking it. Firewall offers multiple settings that you can configure depending on the level of protection you desire for your computer. You can set protection levels to High, Medium or Low for Internet traffic and applications that try to connect to your network. Core Protection Assures complete protection for your PC with a deep system scan through AntiVirus, AntiSpyware, AntiMalware, AntiRootkit, Silent Firewall, and IDS/IPS. AntiVirus :Scans and removes viruses, worms, Trojans, and other threats that may sneak into your system through removable drives, email attachments or Internet downloads. AntiSpyware: Detects, cleans and blocks spywares to prevent identity theft. Keeps your confidential information secure. AntiMalware: Scans registry, files and folders at lightning speed, detecting and cleaning Spywares, Adwares, Roguewares, Dialers, Riskwares and other potential threats. Detects and removes potentially unwanted applications (PUAs). AntiRootkit: Detects and cleans rootkits proactively with a deep system scan. Firewall Protection: Works silently in the background and monitors network activity for viruses, spywares and other malicious agents. Using Intrusion Detection System (IDS), it detects harmful network activity and Intrusion Prevention System (IPS) prevents malicious network activity. Self Protection: Protects Quick Heal files, folders, configurations, and registry entries from getting tampered by malicious threats. It also protects Quick Heal’s processes and services from being stopped. Improved Scan Engine The revamped virus protection avoids rescanning of files that have not been altered since the previous scan. This reduces system resource usage.